217 pages | 2 B/W Illus. Seeking innovative answers to global sustainability challenges has become an urgent need with the onslaught of environmental and ecological degradation that surrounds us today. More than ever, there is a need to carve new ways for citizens and different industries and institutions to unite – to cooperate, communicate and collaborate to address growing global sustainability concerns. 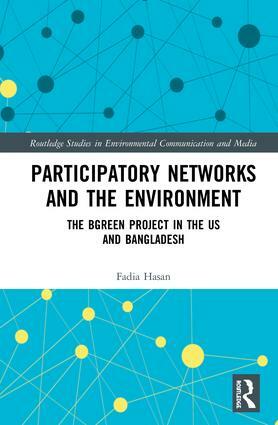 This book examines one such global collaboration called The BGreen Project (BGreen): a transnational participatory action research project that spans the United States and Bangladesh with the aim of addressing environmental issues via academic–community engagement. By analysing and unpacking the architecture of BGreen, Hasan teases out the key factors that are required for the continued momentum of environmentally focused, academic–community partnership projects in order to present a workable model that could be applied elsewhere. This model is based around a unique conceptual framework developed by the author – “transnational participatory networks” – which is drawn from participatory action research and actor network theory, with the specific aim of addressing the common challenge of building evolving, stable and sustainable networks. This book will be of great interest to students and scholars of environmental communication, citizen participation, environmental politics, environmental sociology and sustainable development. Fadia Hasan is a Visiting Assistant Professor at the Urban Studies Program in Trinity College, Hartford, CT, USA. Routledge Studies in Environmental Communication and Media offers a range of progressive and thought-provoking investigations and overviews of contemporary topics in environmental communication and media. Providing cutting edge original research and analysis, the series covers key issues from climate change to natural resources, examining film, advertising, marketing, journalism, storytelling and new media forms. This international and academically rigorous book series offers vital insights to all those engaged with the process of creating and interpreting media messages about environmental topics, whether they be students, scholars, policy makers or practitioners. These interdisciplinary books provide an invaluable resource for discussion in advanced undergraduate and postgraduate courses in environmental communication and media studies, as well as in cultural studies, marketing, anthropology, sociology, philosophy and politics. Please contact the Editor, Annabelle Harris (Annabelle.Harris@tandf.co.uk) to submit proposals.